Meet the loyal, strong and sure-footed Finnhorses in a local farm. 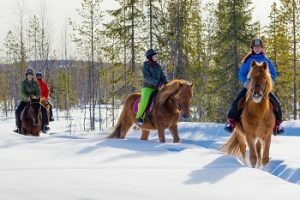 We make a light, 1-hour riding tour, heading to the snow-filled forest nearby. After the tour, we sit around the fire and talk about the Finnhorse, warming ourselves with hot chocolate.